Make Money with Panic Anxiety Gone! We pay you 75% for EVERY sale referred! It's priced right and completely sells itself! Psst! Are you new to Affiliate Marketing and want some tips to help you explain and maximize your campaigns? For Beginners Affiliate Tips and Information, click here. Send traffic through your hoplink and get 75% of everything you sell! Panic & Anxiety Gone is written by Edward Golding, who provides a guaranteed 4-Step Holistic System to stop panic in its tracks and eliminate unhelpful anxiety for good. "Panic & Anxiety Gone" eBook, a 100-page guide outlining a holistic, natural, and long-term approach to managing the root cause of panic and anxiety, as well as stopping panic attacks before they escalate. Topics include: Why You’re Feeling Anxious … and EXACTLY What It Means, Medical Conditions That May Underlie Your Symptoms, a 10-Point Panic Prevention Plan to Halt Panic Attacks, a 5-Point Anxiety Management Plan to Deal with The Root Causes of Anxiety in Your Life, Natural and Alternative Therapies, and Medical Options. Bonus eBook "Speak Easy: A Guide to Public Speaking Skills" Instead of letting your fear of public speaking rule you, isn't it about time that you faced your fears and became a better speaker? Discover all the tips and techniques to you need to be the most confident public speaker with Speak Easy. Bonus eBook "Stress The Silent Killer - How to Cure Your Stress Problems" This eBook will teach you to understand your stress, discover its causes, understand how stress is affecting your health and relationship, and simple changes you can do to reduce the stress in your life. Discover how techniques like time management, goal setting, meditation, progressive relaxation, alternative therapies, breathing, and more can make stress-related problems a thing of the past. Bonus eBook "Building Self-Confidence: Developing the Skills You Need to Be Confident" This packed newly released e-guide can help you develop essential skills necessary for living an anxiety-free life - Build your self-confidence skills today! Bonus eBook "Understanding and Treating Depression" If you are serious about understanding and finding ways to combat your depression and get your life back, this eBook is a must! Understand and treat your depression and put and end to the suffering, starting today. 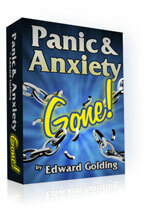 Familiarize yourself with the product by visiting the Panic & Anxiety Gone sales page. So you're looking to promote Panic & Anxiety Gone via the various pay per click search engines? Google Adwords - This is the biggest and best volume for traffic quality. Has a great user interface, however is also often the most expensive. Yahoo Search Marketing - Also very good for targetted high quality traffic. Not as high a volume as google, but still enough to be considered very significant. Don't forget to sign up to Yahoo USA, Yahoo UK and Yahoo AUS individually as you need to sign up to each one separately for some strange reason. It's a bit of a nuisance doing this, but well worth it. Yahoo UK and USA in particular are absolute must haves, while Yahoo AUS is growing and has a fantastic Return on Investment per click. MSN Adcenter - Growing all the time. Very good conversion rates. The volume of traffic is much lower than google and is about half that of yahoo, sometimes even less, but often comes cheaper with a higher return on investment. Well worth having. Looksmart - Often underrated, can produce very good return on investments. Miva - Up and coming ppc search engine that has been known to produce good results. 7search - A smaller search engine with good quality traffic. Good interface. They claim better ROI than either Google or Yahoo! because of their high quality traffic sources. Go click - Cheap traffic, with a growing and loyal following. GoClick still lets you start an account with only $10 and bid from 1 cent. Enhance - A strong emerging Pay Per Click search engine that has good solid quality control. Search123 - One of the first PPC search engines. Cost effective with good support. Fund with $50 and they'll give you $20 free. Use this pre-written email promotion to tell your website visitors and newsletter subscribers about the Panic & Anxiety Gone eBook. Remember to format the content and layout to suit your site/ emails and insert your hoplink and details. You encounter a stress situation and your chest feels tight. Your stomach is churning and you feel dizzy and nauseous. It feels like you are going to faint, or even die. At that moment in time the only thing you can focus on is breathing and staying conscious. For over 40 million Americans this experience is a way of life, a paralyzing, crippling condition that has a significant impact on how they live their lives, in constant fear of experiencing another panic attack, and wondering when it will happen. Until recently I wasn't aware of the implications of anxiety and panic attacks, that is until I met Edward Golding. Edward Golding is author of "Panic & Anxiety Gone," and a former anxiety and panic attack sufferer, but looking at him now you would never guess. No more sweating, trembling, gulping and shallow breathing, Edward is a changed man. Sick of being reliant on drugs and having to deal with their side-effects, he researched and discovered a better way of managing and overcoming the anxiety that was crippling his life. Looking at him now you would never guess he was the same guy that only a few years ago had a very real social phobia that nearly prevented him from finishing college. The internet hosts a number of so-called experts, claiming that their new patented method will work wonders for your anxiety disorder, but very few can deliver on the promise in the way that Edward can. After talking to Ed, I did a bit of research on the subject and realized that Ed knows a lot more about panic attacks than I thought. So what makes his product different? Well the first thing is that he doesn't promise to fix your anxiety issues in one step. If our lives were designed to be that simple, anxiety attacks wouldn't affect 40 million people. Edward takes his anxiety and panic attack research a lot further than others and has created a holistic 4-Step System to stop panic in its tracks as well as prevent future attacks. It's innovative, thorough, and brilliant! People are complex beings and Edward recognizes that. A method that may work for one person isn't guaranteed to have the same effect on the next person. Why is that? It's because we are all different. The things that trigger one person's panic attack are quite different for the next. So why should we believe that one method, technique, or mantra is going to be a magic cure-all for everyone? It isn't. Edward Golding has developed a holistic 4-step system that takes into account a whole range of recommended methods and techniques, and takes you through surviving your panic attack as it is happening, as well as making lifestyle changes and setting action plans and methods in place that will stop anxiety attacks from occurring again. That's what I really liked about "Panic and Anxiety Gone," it helps you through the panic attack and then helps you make changes to your lifestyle and management of anxiety in your life. "Panic & Anxiety Gone" examines why you are feeling anxious and exactly what it means. That's really reassuring. One of the most scary parts of anxiety is not understanding why it is happening. Edward does a great job of breaking it all down and explaining what it's all about. Next, he looks at panic attacks and ways of diagnosing one. There are actually a number of conditions that mimic the same symptoms of panic attacks, and it helps to know what they are! Edward then deals with the panic attack itself and ways to get through it. He has created a 10-Point Panic Prevention Plan that is invaluable in helping you get through a panic attack with as little distress as possible. It's great stuff and really addresses the root of your panic attack and how to survive it. The third step in Edward's system is eliminating anxiety for good. This is where this book really comes into its own. He identifies predispositions to anxiety, triggers, lifestyle factors, and a 5-point Anxiety Management Plan that addresses key factors like diet, exercise, relaxation techniques and much more. Step 4 looks at examining your options for professional medical care, and demystifies the process by examining what options are available and what is involved in a formal diagnosis. This would have to be the most thorough look at anxiety and management of panic attacks that I have seen. I was truly impressed and I know you will be too. Let's face it, anxiety is all around us and the most effective method is in finding new ways to manage and live with it, processing it in a positive way instead of letting it build up and trigger another attack. Edward Golding's "Panic & Anxiety Gone" is a must-have for anyone serious about eliminating anxiety attacks and changing their life for the better. And take control of your anxiety today. More than forty million American adults suffer from some type of anxiety or panic, and for many, it has a very real cost to their lifestyle. If you find yourself arguing with your partner more frequently than normal; catch yourself side-stepping social events; or perhaps even fostering unrealistic feelings of fear or apprehension there’s a good chance you are experiencing some type of anxiety disorder. Undoubtedly, you’ve heard the term “panic attack.” The reality is that panic attacks are real, but they are just one of many types of anxiety disorders. One myth surrounding anxiety is that having an anxiety disorder somehow makes you a bad or weak person. Everyone has had feelings of anxiousness or fear at some time or another. How a person deals with those feelings is what determines if it is ruling your life or not. For a growing percentage of society, the impact of anxiety is very real, and that only reflects cases that are reported. What is really alarming is that many adolescents and children are also affected by stress and anxiety. The body's basic response to stress is significant in how a person protects themselves from perceived treats. It measures a person's chances for survival when faced with danger or a potentially dangerous situation. A person can either face the stress and fight back, or retreat and take flight. The fight or flight syndrome is a person's reaction to stressful circumstances, even in the ordinary course of life. Such reactions or choices are inherent in your modern fight for survival. Your fight or flight reaction is stimulated the moment you are faced with a potentially dangerous situation. The smell of danger keeps the adrenaline rushing through your veins, and gets your heart beating faster. This is what makes you feel faint or weak. The strange thing is that it is your body's way of preparing you for fight or flight! Just try running when you feel like this. You might be surprised at how fast you can run! At the fight or flight stage, you have a choice to make; you can either become aggressive and face the danger, or be passive and retreat. Allowing yourself to become exposed to fight or flight situations regularly can be stressful and dangerous to your health. It can backlash and lead to heart ailments, migraines and soaring blood pressure, and for many it leads to social withdrawal. However it doesn't have to rule your life. If you or a loved one experience continuous bouts of fear, concern, or apprehension of some unknown event, now is the time to examine your lifestyle. Manage and eliminate your anxiety today. If you suffer from panic attacks and anxiety and want relief... if you're tired of trying pills, potions, and therapy... If you'd like to eliminate anxiety once and for all, as safely, naturally, and as effectively as possible... then it's time to take control of your fears. Author Edward Golding is a former anxiety sufferer who has created a guaranteed 4-step holistic system that provides a natural and long-term approach to managing the root cause of panic and anxiety. Edward has the secrets to free you from the pain of anxiety and help you get your life back today. Anxiety attacks can be frightening and even paralyzing when they occur, but it doesn't have to rule your life. They can be very frightening for the patient but can easily be treated through a program or management strategies and mechanisms. What is an anxiety attack? It is an intense feeling of terror and panic. The person feels that they are losing control and will experience all the symptoms of being incredibly frightened. These include increased heart rate, sweating and shaking etc. These attacks can come suddenly and without warning. They can last for about 5-30 minutes, but the actual symptoms can last quite a bit longer. Sometimes it can be a simple as an overactive thyroid (Hypothyroidism.) This condition will speed up a person’s metabolism and body functions. This leads to insomnia and extreme nervousness. The results will be anxiety or panic attacks and symptoms similar to maniac depression. This condition can also lead to depression. Heredity, childhood factors, biological factors can make people more susceptible to panic attacks. Manic or bipolar depression patients can also suffer from these anxiety attacks. Stress or depression can be part of anxiety attacks and can aggravate the situation. Caffeine and nicotine or recreational drug use can also have an impact on your susceptibility to anxiety. Treatment: It is very important to treat anxiety attacks early or they will become habitual and may develop into something worse if neglected. They will not just go away. Managing and treating anxiety can involve a number of viable alternatives that you can use either instead of, or in conjunction with medicine. Yoga is a good alternative medicine and can be used to reduce stress and regain control over you. Mediation, breathing exercises and physical positions help you to relax and release tension. Yoga’s calm yet disciplined approach to life can cut down panic attacks and allow you to improve the quality of your mental and physical health. Eating better and exercising will help you to keep your body on a more even keel and will relieve stress. This can often help with panic or anxiety attacks. Excess of junk food can cause mood swings, which can aggravate your condition. Sometimes you cannot find a cause for these attacks and it is often this that makes many sufferers so upset. If you are having anxiety attacks on a regular basis, correct diagnosis and options for treatment should be discussed with a doctor, but for many people understanding anxiety and exploring alternative treatments can minimize the impact of panic attacks. Do not feel that you will just have to live with these attacks and the suffering that comes with it. Knowledge is power. Explore options for treatment as early as possible and get your life back in control again.